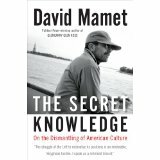 Earlier the hardworking staff noted the gleeful reception conservative publications are giving born-again playwRIGHT David Mamet, who new book is titled The Secret Knowledge: On the Dismantling of American Culture. The Weekly Standard and the Wall Street Journal have both lavished praise on Mamet’s liberal-bashing coming-out party. Years ago, you described “American Buffalo” as being about “how we excuse all sorts of great and small betrayals and ethical compromises called business.” In this book, you defend enormous payouts to C.E.O.’s working for failing corporations. You seem to have changed radically. I have. Here’s the question: Is it absurd for a company to pay hundreds of millions of dollars to a C.E.O. if the company is failing? The answer is that it may or may not be absurd, but it’s none of our goddamned business. Because as Milton Friedman said, the question is not what are the decisions but who makes the decisions. Because when the government starts deciding what’s absurd, you’re on the road to serfdom. You wrote that Karl Marx “never worked a day in his life.” But how is his writing “Das Kapital” fundamentally different from the way you make a living? You realize you’re not a plumber, right? Jesus Christ. Listen, here’s the thing about an English degree — if you sat somebody down and asked them to make a list of the writers they admire over the last hundred years, see how many of them got a degree in English. On behalf of all the English majors out there – ouch. Then again, Mamet didn’t really answer the question, did he? Which leads to this conclusion: For left-leaning news outlets, it’s possible that Mamet’s answers are less important than their own questions. This entry was posted in Uncategorized and tagged David Mamet, New York Times, Talk, The Secret Knowledge, Wall Street Journal, Weekly Standard. Bookmark the permalink.